It’s not always easy to find the best organic fertilizer for fruit trees, especially when there are several options available. However you came at the right place as we won’t just present you the most successful products, we’ll also tell you what makes them so good. Additionally, we have a short guide showing you how to decide which one to get. 2 Do you fertilize or not? 4 What should I get? Before buying a fertilizer, you first need to know the needs of your plants and soil. Some plants or trees need different nutrients than others, and the puzzle doesn’t end here. For instance, two trees of the same type, growing a short distance one from the another, can require a different care routine between them. To thrive, fruit bearing trees require a lot more nitrogen than other plants. You’ll have to learn where to find this substance, especially if you want an organic source. Additionally, not all fertilizers are the same, as some are created specially for fruit trees, and others for ornamental plants. To make the situation more complicated, some type of fruits will need different nutrients than others. For instance, if you want to grow your own bananas, you’ll have to search for a potassium rich fertilizer. Other trees, need much less of this substance. You should also learn when to fertilize fruit trees, based on their type and the climate you live in. Not everyone is aware that the fertilizer should be applied based on the plant type and season. What’s more, is that too much nitrogen after a certain month can determine your plants to grow too many leaves and you may not want that. Do you fertilize or not? You should also know that just like animals and humans, plants also have different needs during different seasons, and even from one year to the next. This means that you may not need to give them nutrients and vitamins every year. To better determine how much feeding does your tree need, you’ll have to measure it. What you’ll measure is its yearly growth. Measuring the growth is rather easy: locate the last growth ring and measure to the end of the branch. This part has a different color than the older parts of the tree. Make sure to have several reference points, and find their medium. For each type of tree, there are different number limits indicating a normal growth. You’ll have to fertilize when your average is on the lower end. Clearly the tree or the plant won’t know what type of fertilizer it receives, but you do. And you probably grow all sorts of plants to feed your family. Then, it’s easy to understand that what your plants feed on, will pass onto your system. There are other advantages to buying a natural fruit tree fertilizer. For instance, they release nutrients at a slower pace, providing a steady flow. This means you’ll need to purchase it less often too, thus saving some money. This type of fertilizer doesn’t burn delicate roots, improves the structure of the soil, its water retention, while also helping earthworms and other soil microorganisms to live. Having presented you with a few considerations to know before spending money, it’s time to show you some products! Below are the most appreciated compounds to use on your tree and other plants. Jobe’s Biozome is a biodegradable and sustainable organic fertilizer for your garden needs. The fertilizer is USDA approved and helps with restoring and maintaining your trees in order to bear more fruit. Containing Mycorrhizal fungi and Archaea, the fertilizer enhances soil quality and helps fight insects, drought and the loss of nutrients. The Mycorrhizal fungi aids the plants in absorbing nutrients, while the archaea cleans the ground and improves its state. Available in a granular texture, the product can be used for potted or outdoor plants. To get the best results when planting, all you have to do is add one and half cup for a 16 inch pot and mix well. The product should be applied every 2 to 3 weeks to promote tree growth. As such, many found it to be the best fertilizer for plum trees but also for other kinds like cherry, pomegranate or nut trees. Due to being organic, the fertilizer can give off a bad smell for a couple of hours until being absorbed by the soil. Although this product is said to be pet safe, some customers reported dogs getting sick after eating it. The product can help restore trees in as little as 5 days, but also increase their nutrients uptake in the long run. Urban Farm Fertilizers Apples & Oranges. 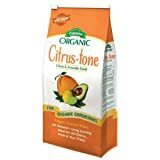 Fruit & Citrus Fertilizer. 1 Gallon. Makes 256 gals. This fertilizer comes in a bottle, and it’s super concentrated. It’s also specially designed for small farms. Additionally, it’s also really easy to use: either with a hose end sprayers, hand watering or other dispersion methods. The product is best used as soon after purchase because it’s freshly made. If longer time passes, the solution will not have the same consistency and will need shaking up to regain it. The package reads that apples and oranges will benefit the most from it, but in reality all plants do better after receiving some of this fertilizer. Since it’s liquid, it gets absorbed into the soil in no time. As the label shows, the product is specially formulated as an apple tree fertilizer. 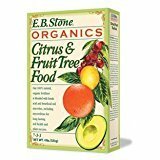 EB Stone Organics Citrus & Fruit Tree Food 7-3-3, 4lb. Here is a fertilizer specially designed for citrus trees as well as other plants that make small fruits, like berries. It contains chicken manure, blood, alfalfa and kelp meal, bat guano, and some special fungi. Trees that cast shade, bear flowers, or ornamental vines also benefit from this mixture. Those growing avocados can also use the EB Stone tree food suggested here. For avocados, only 3 applications per year are needed, as opposed to other kind of trees and plants. The nutrients in this compost get released in at least 1 month, but it can take up to 4 months. The organic fertilizer created by Dr. Earth is suitable for most types of plants, but especially so for most types of fruity trees and shrubs. When following the directions on the package, you won’t need to use any other chemicals on your plants. The blend contains feather, kelp, cottonseed, alfalfa and even seaweed feed and extracts. If you grow banana trees, you’ll have to search for another product as this one lacks potassium which bananas need. On most trees, new leaves start growing within a couple of days, including on those that you considered dead. The product is not sold specifically as a pear tree fertilizer, but the fruit is seen on the packaging. Like with most similar products, this one too has a pretty strong smell, especially when used indoors. However the odor seems to dissipate in some 24 hours. The product can be applied both dry or as a sort of tea. When used dry, one has to mix it with the soil and then add water. If you want a fertilizer that can be used on more types of trees, then the Espoma CT4 5-2-6 Plant Food could be something to consider. The product can be used on a variety of fruit bearing trees, such as nut trees, citrus and other kinds. Many living organisms have been used in this compost to form a balanced source of nutrients. It’s better to use the present fertilizer at a distance of at least 6 inches from the plant’s roots because of its strength or to seek another feeder if your plants are shorter than 6 inches. Another downside is that Espoma CT4 5-2-6 doesn’t contain iron, a substance some plants may need. Most folks used this compound on potted citrus trees, especially on the lemon and lime kind, and they saw changes within 2 days from the first application. 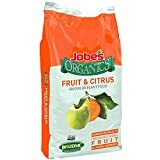 Those who never used this organic fruit tree fertilizer before should know that it gives off quite a strong smell for a few days after use. Additionally, dogs should be kept away from it as the scent attracts them and they might be willing to eat the product. For the best results, you’re advised to follow the instructions. It’s pretty easy to see that growing your own fruits is not always an easy task. However your rate of success will be higher when helping your plants grow by using nutrients coming from natural sources. Your health will also benefit from choosing any of the products suggested above.